Proper maintenance is crucial to maximize the life of asphalt pavement. Mrs. B recommends routine inspections and preventative procedures, especially with the harsh winter seasons in the Chicago area. Regular seal coating, crack fill and repairs are cost effective methods of protecting your parking lot from the damaging combination of freezing temperatures, snowplowing, and salting. An onsite evaluation of your parking lot by our experienced personnel will assist you in determining the most prudent course of action to take when the asphalt begins to deteriorate. We take into account the age and size of the parking lot, past and future traffic patterns, and most importantly, your budget when providing an estimate. Mrs. B neither recommends more than we feel is not absolutely necessary, nor do we advocate short-term solutions that cost you more in the long-term. However, we will provide you an estimate on all options; along with our expert advice on which alternative we feel best addresses your needs. Simply filling a damaged area with hot asphalt and compacting the mix can sometimes remedy small potholes and is the least costly option. When cracks begin to form in asphalt, water seeps through the cracks and into the stone base. During the normal freezing and thawing cycle, the cracks will widen, allowing more water to drain into the substrate, which eventually compromises larger areas and causes the break-up of the asphalt. When this occurs, we recommend removing the damaged area and replacing the asphalt (often called R&R - Remove and Replace). The damaged asphalt is cut out by a high-powered saw and removed. The stone base is re-compacted. (In extreme cases, the stone may also need to be removed and replaced, or additional stone installed.) The edges of the cut asphalt are primed to provide an adhesive of the new asphalt to the old. The area is then repaved and the mix rolled and compacted to level with the existing asphalt. The cost for this procedure depends on the size of the R&R area, as well as if any of the stone base needs excavating and replacement. However, an R&R patch is a viable option when only certain areas of your parking lot require repair. Installing asphalt pavement requires a knowledgeable, skillful crew. Beginning with a carefully designed plan, whether it be a professionally drawn blueprint or a homeowner’s vision of their new driveway, an experienced veteran is well aware that the finished product needs to not only be functional, but should be built to last for many years. The area to be paved will be excavated and graded for proper drainage. Sewers and catch basins will be installed if needed. The stone base will then be laid, the depth dependent on the expected traffic flow. (A more substantial base is needed for heavy truck traffic.) This stone is then compacted by a vibratory roller. A waiting period of anywhere between a couple of weeks to a month may be necessary to allow for adequate settling of the base layer. After it is determined that the area is sufficiently stable enough to support the weight of the asphalt, the paving begins. For heavier traffic areas, a layer of asphalt binder will be installed first and compacted. The surface course asphalt will then be laid, rolled and compact. (Any optional strengthening processes, such as geotextile installation or priming of the stone base, will be performed at the applicable stage.) The area is then ready for any signage, bumper stops, striping and marking. In extreme instances, it may be necessary to remove and reinstall the entire asphalt area. As this is a more costly option than resurfacing, it is usually only required when the pavement has deteriorated to the point where the substrate has been compromised or large portions are so damaged that an overlay is impossible. Oftentimes, the stone base has failed for a number of reasons and can no longer support the weight of the traffic on the asphalt. Drainage problems can cause soft areas under the existing pavement, which results in sinking and breaking of the asphalt surface. Or, simply a combination of age, wear and tear, extreme weather and insufficient maintenance necessitates the installation of a new parking lot. The old asphalt will be removed and hauled away. The stone base will be re-graded and compacted. If needed, contaminated stone (stone that has mixed with ground water or mud) will be removed and replaced, or additional stone added to shore up the base. Typically, the area will first be paved with a layer of binder asphalt, which consists of coarser materials and provides a stronger base layer between the stone and surface asphalt. The binder is rolled and compacted. The area is then paved with a layer of surface asphalt, which is also rolled and compacted. The depth of the stone base, binder and surface will be determined during the site evaluation. These depths vary depending on the type of traffic the pavement will encounter and have the biggest impact on the cost. However, sufficient amounts of each layer are crucial to the viability of the pavement, so Mrs. B never recommends short cuts be taken to lower the price. In general terms, resurfacing is the process in which a new layer of asphalt is installed over an existing asphalt surface. When asphalt deteriorates to the point where cracks begin to interconnect and create a pieced together surface (like the skin of an alligator, hence the term "alligator cracks"), there are low areas holding water, or the cost of patching several large areas becomes cost prohibitive, overlaying the pavement is recommended. The area is cleaned and prepped. If the asphalt butts into a sidewalk or street, a section will be saw cut and removed or ground down to allow for a smooth and level transition to the concrete from the new layer of asphalt. The existing asphalt will be “primed”, which means a tack coat will be applied so that the new asphalt adheres properly. If necessary, one option for added strength is to install a geotextile fabric at this point. This non-woven fabric, sometimes called “road fabric”, “geomat” or “petromat” provides an additional layer of waterproofing and helps prevent reflective cracking between the old and new asphalt. A leveling layer of asphalt is first installed, at varying depths, which helps correct depressed areas of the asphalt. (Please note: Drainage problems need to be addressed at the site evaluation. Depending on the cause and severity of the problem, other corrective measures may need to be taken.) The entire area is then paved over with approximately 1-1/2" to 2" of surface asphalt, which is rolled and compacted. Striping and marking of the parking area follows, if required. There are several factors, which play a role in determining how quickly the lot can be reopened to vehicle traffic, but typically a 24-hour cure period is recommended. Asphalt seal coating slows pavement deterioration. Sealer works as a waterproofing agent, filling hairline cracks, repelling moisture and providing a barrier between the porous asphalt surface and the corrosive effects of gasoline, oil and salt. Regular seal coating will protect your investment and prolong the life of your pavement. In addition, a fresh coat of sealer beautifies your pavement and shows pride of ownership. The appeal of a well-maintained parking lot or driveway enhances the value of your property and presents a positive image of your business or home. We use only Brewer Cote products. Brewer-cote concentrate is a heavy-duty coal tar emulsion sealer that is manufactured under strict quality control standards. The concentrate is diluted with water, at a ratio of approximately 70% sealer and 30% water, which is recommended by the manufacturer. Typically, in larger areas, the sealer is applied with a fine mist sprayer, which allows for even coating. We prefer this to a squeegee application, which has a tendency to leave lines in the drying process. There is an advantage to hand squeegee, however: More sealer is left on the surface, providing a thicker barrier between the asphalt and the elements. The most effective means of application will be determined at the site visit. Mrs. B normally adds a mix of Black Beauty sand, which provides more traction (inhibiting slips and falls) especially on older lots that have a build up of sealer and a hardening additive for additional strength. Prior to seal coating, all vehicles must be removed from the property and sprinkler systems turned off. The area will be marked by traffic cones or roped off to prevent vehicle and foot traffic. As some businesses must remain open, we will schedule the procedure to be done over the course of two or more days, carefully coordinating to allow for the flow of entering, exiting and foot traffic. We begin by thoroughly cleaning the pavement using high-powered blowers, wire brushes and brooms to ensure that all dirt, debris and vegetation are removed. Gas and oil spots will be treated with a primer coating that allows adhesion of the sealer to the asphalt. If the separate process of crack sealant has been requested, it will be performed at this point. The sealer will then be applied via the predetermined method. When adequately dry to foot traffic, striping and marking will be done. After that, a minimum of 24 hours is required for drying time, which allows the sealer and paint to properly cure and adhere to the asphalt surface. Sprinklers should remain off for a 48-hour period. Obviously, seal coating should not be performed under adverse weather conditions. A forecast of rain or cold temperatures (under 55 degrees) will require the application to be postponed and rescheduled. 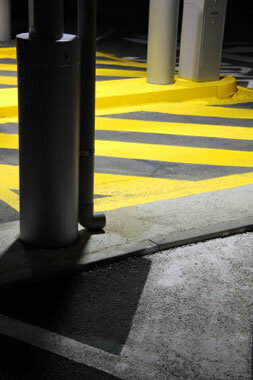 Mrs. B uses only high quality, state approved traffic paint (in yellow or white) for striping and marking parking lots. 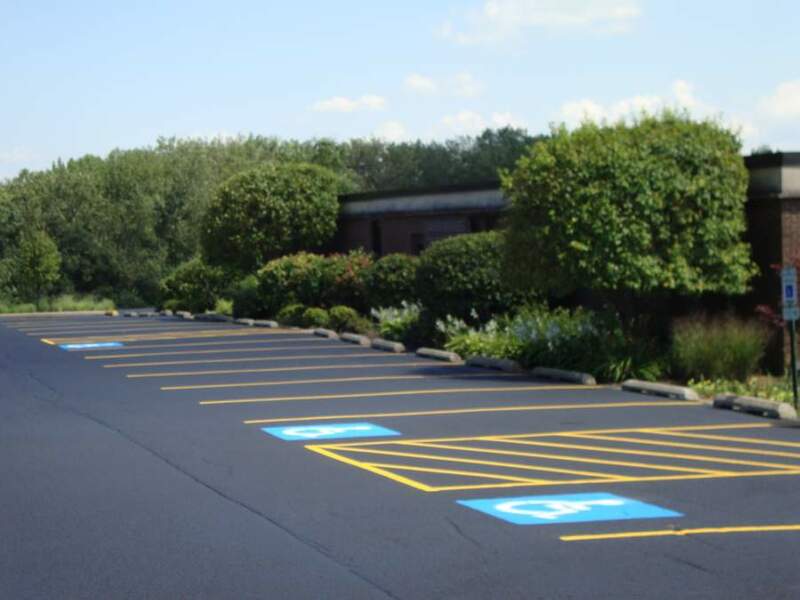 We will restripe per your current design, or layout new lines (along with handicapped areas, arrows, no parking signs, etc.) per your blueprints or drawing. We will offer our expert advice, if requested, in helping you to properly direct traffic flow. Entrances are blocked off to prevent traffic on newly applied paint. The area is cleared of debris. When restriping (over existing lines), the pattern is visible even through newly applied sealer. The paint is applied with a walk behind striping machine, which sprays the proper amount of paint at the width required. If an optional fast-dry additive is mixed in with the paint, the area can be open for traffic after one hour. Mrs. B provides parking lot snow removal and salting services. We offer a variety of contracts, which will be customized per your preferences. Per Inch Plowed - A simple contract that charges by the inches of snow plowed. Min/Max - Contract is based on a set seasonal rate amount (minimum), which allows for a maximum number of occurrences and/or a maximum number of inches plowed, with an additional charge when the maximum is exceeded. Monthly - Same as Min/Max, but can be paid in monthly installments over a predetermined period of time. Multi-Year - One of the above contracts covering an extended period of time. Per Hour - Cost determined by the hours worked to clear and salt lot, per occurrence. Repairing cracks is important in prolonging the life of the pavement. When water penetrates the asphalt through cracks, the stone base may be compromised. Extremes in temperatures and the freeze-thaw cycle will cause the cracks to expand and will speed up the deterioration of the asphalt. Therefore, the sooner you respond, the better your chances of preventing premature resurfacing. Mrs. B recommends a treatment referred to as hot crackfill. This is typically done prior to your regular seal coating. We use a high-powered blower to remove debris from cracks wider than 3/8". Areas that are badly damaged with alligator cracks should be repaired by removing and replacing the asphalt, not by crack fill. The cleaned cracks are then filled with a rubberized hot pour material. When this material cools, it forms an impenetrable, flexible barrier. Seal coating the entire area will not only beautify the area by camouflaging the crack fill, but will also fill in any hairline cracks.